Trading has been rather boring for the first four months of 2017, with a giant trade that was opened in XIV in early Nov 2016 carrying all the way into mid-March. Notice the lock-step of our indicators with XIV through mid-March while we enjoyed the continuation of conditions to hold XIV, including an amazing +30% return in January. Our VRP+VXX Bias kicked into cash for most of April as the market showed signs of increasing uncertainty and then moved back into a short volatility position for the end of April. 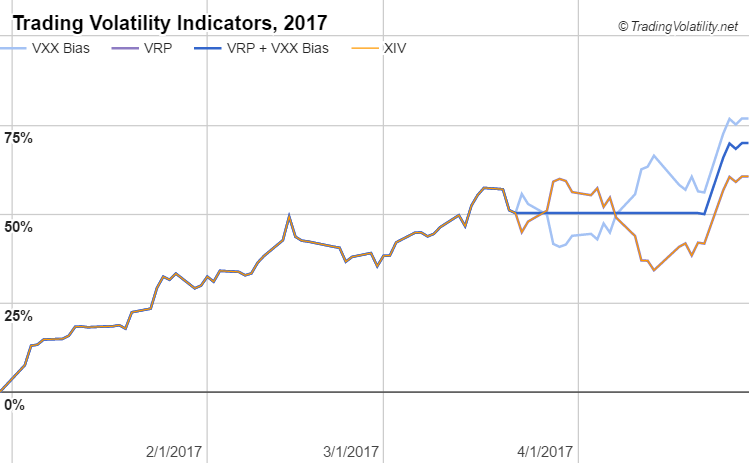 XIV (buy-and-hold) remained in-line with VRP at +61% YTD through April. While we no longer offer auto-trading for VRP+VXX Bias, we continue to track our results via Collective2 here.